80 years ago in 1935 – FLOODING: On 8th August Lavendon experienced the heaviest rainfall that could be remembered. In a matter of minutes the village street was like a river and quite a few campers found their tents and beds washed out. Accommodation was found for the men in the ‘George Inn’ Clubroom for the night. SPEED LIMIT: The Parish Council met and agreed to write to the County Council asking that the speed limit should be extended to the entrance of the village from Olney. It was pointed out that this is a very dangerous road and that most of the children pass that way to school. At one point there is only 16 feet of roadway and no footpath. ANNUAL OUTING: The Church Sunday School went by motor-coach to Hayling Island for their annual outing. UNUSUAL ACCIDENT: While cycling along the Bedford Road near Turvey Station on 22nd August Walter Jamison, of Harrold Road, Lavendon had an unusual accident. Hearing a noise in the front part of his cycle he bent down to see what was wrong. By some means his hand slipped in between the spokes of the front wheel, with the result that he was thrown over the handlebars. His hand and face were severely cut. 70 years ago in 1945 – LAVENDON CRICKET CLUB which had been inactive since 1940, was revived, and the following officers were appointed to do the work until the former officials came out of the Services: Mr. R. Panter, chairman; Mr. J. Hallworth, hon. secretary; Mr. T. Cony, hon. treasurer; Mr. E. Clare, captain. ANNUAL FETE: Because of inclement weather, the second annual fete, flower and vegetable show at Lavendon was transferred from Home Close to the School and playground. Entries, although less than the previous year, were well up to standard, and prizes were awarded to 60 competitors. Later there was an auction sale of entries. Music was provided by a band from Bedford, and the side-shows and amusements were: Wembley wheel, loaned by Mr F. Lay and run by Messrs. E. Clare and J. Hallworth; skittles, Mr. R. Panter; treasure hunt, Mrs. Brady and Miss Quenby. Competitions for a doll, cake, and wine were run by Messrs. A. Willey, J. Green, and F. Kitchener respectively. Proceeds were for the New Village Hall Fund. In the evening a successful dance was held in the Ambulance Hall. FLOODLIGHTING AT LAVENDON: Victory Day celebrations at Lavendon began with a united parish thanksgiving service conducted by the Rector in the Parish Church. The large congregation was called to worship by a lively peal on the bells. Collections for church expenses were taken. In the evening there was general rejoicing on the Market Square, which was floodlit. Dancing continued on both days until 3 a.m. A large bonfire was lit in Home Close and soldiers from a near-by station provided fireworks. A number of casualties from the fireworks received ready attention from the village Ambulance Brigade. LAVENDON DEMOBILIZED: Three former members of the Lavendon Division of the St. John Ambulance Brigade were recently demobilized from the Royal Naval Sick Berth Service. They are Petty Officers T. Holmes and F. Odell, and Attendant P. Spriggs. As reservists they were called for active service in August 1939. Throughout the 1914-18 war they served as infantrymen with the Army in Northern Europe and the Balkans. 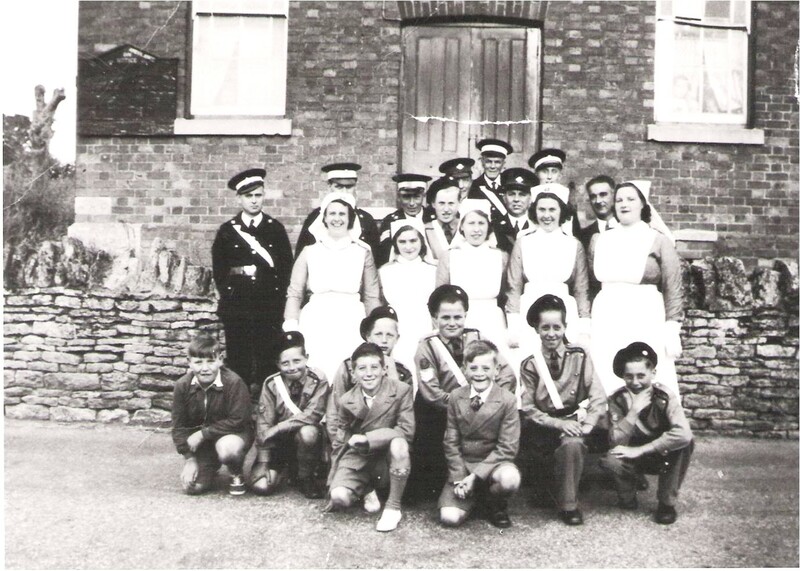 Petty Officer Holmes was the Superintendent of the Lavendon Ambulance Brigade, while Petty Officer Odell and Attendant Spriggs held the rank of sergeant. Posted on Saturday, 1 August 2015 by Editor •	This entry was tagged Timeline. Bookmark the permalink.